Just as we should think before we speak, we need to think before we write. Most of us are not poets or novelists, but we are all writers. We email, text, and post; we craft memos and reports, menus and outdoor signage, birthday cards and sticky notes on the fridge. Get a Grip on Your Grammar is a grammar book for those who hate grammar books, a writing resource filled with quick answers and a playful style--not endless, indecipherable grammar jargon. The differences between "lay" and "lie." The proper usage of "affect" and "effect." Where to put punctuation around quotation marks. The meaning of "e.g." versus "i.e." The perils of overusing the word "suddenly." That apostrophes should not be thrown about like confetti. And 243 more great tips. Writers owe it to themselves and to everyone who sees their written words to get it right. With Get a Grip on Your Grammar, they finally can (not "may"). With a bachelor of arts from the College of William and Mary and a master of liberal arts from the University of Richmond, Kris Spisak began her career as a college writing instructor. After six years in the classroom, she shifted her work toward professional writing and editing, working with businesses on their communication goals and individuals pursuing their publishing dreams. As a teacher, editor, and speaker, Spisak has helped writers of every level sharpen their writing craft. She is the cofounder of Midlothian Web Solutions, on the board of directors of James River Writers, and an avid writer of fiction. She lives in Richmond, Virginia. 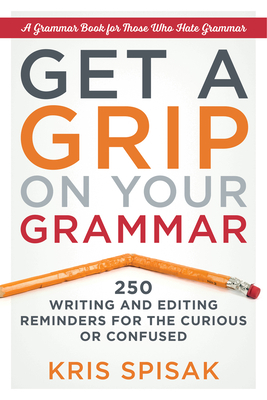 "Get a Grip on Your Grammar is not only a useful reference, but it is also a fun read, chock-full of telling examples and pop-culture references." "Is it a dash or a colon here? Should I write first person or third? Is it 'already' or 'all ready'? In this handy manual, grammar guru Kris Spisak offers us her thoughts and tips on the writing questions that dog every writer's life. You'll want to keep a copy on your desk." "If you add one book to your home library this spring, make it local author Kris Spisak's new book, Get A Grip On Your Grammar. Fabulous help for you, your kids, and those upcoming graduates!"